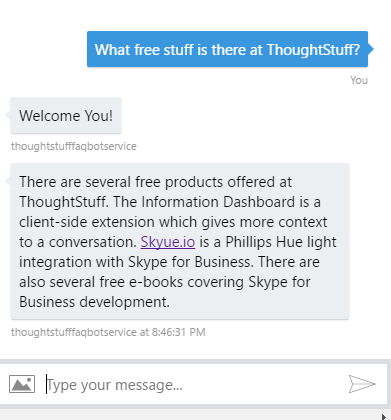 In this three part series we’re going to go through a worked example for me to create a bot for my website: thoughtstuff.co.uk. 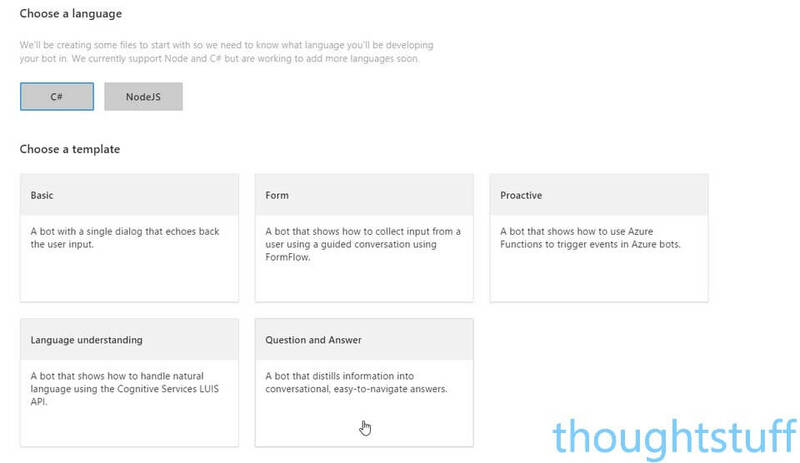 In Part 1 we created a knowledge base of questions which users can ask. In Part 2 we’ll create the bot which will take those questions and return answers. In Part 3 we’ll configure the bot to show alongside webpage results. 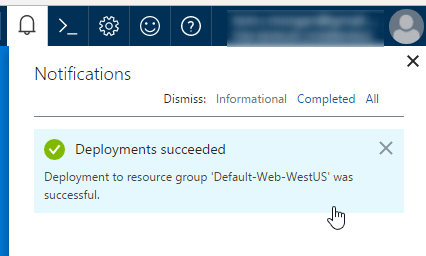 Go to the Azure Port (portal.azure.com) and Register / Sign in. Click the green plus sign in the top left corner and in the search box type Bot Service. Choose the Bot Service application from the list, and click Create. Provide a name for your Bot Service app, and either provide a name for a new Resource Group or choose an existing one. Choose a location which is closest to where the majority of your users are expected to be. Click Create to create the service. Unless your an experience bot developer you probably don’t want to have to write all the code to interact with the knowledge base you created in Part 1. Luckily there is a template wish does all this hard work. You’ll see a popup asking you select which knowledge base to use. Select the one created in Part 1 and click OK. If you’re a developer, or are interested, then you can look through this to see what the bot is actually doing when it takes the user input and passes it to the QnA Maker service. If you’re not interested, then you can safely ignore it. Notice that the question I asked wasn’t exactly the question I fed into the QnA Maker. That’s the power of the QnA Maker: it’s using advanced Artificial Intelligence to work out the meaning of the question and match it to the correct answer. The result is happier users getting their questions answered better! We now have a working bot which can answer questions. In Part 3 we’ll complete the configuration so that the bot shows up in search results.